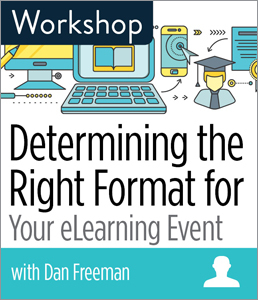 CHICAGO—ALA Publishing eLearning Solutions announces an exciting new workshop, Determining the Right Format for Your eLearning Event with Dan Freeman. This workshop will last 90 minutes and take place at 2:30pm Eastern/1:30 Central/12:30 Mountain/11:30am Pacific on Wednesday, Nov. 7, 2018. Webinars, eCourses, live, on demand, micro and nano-learning—with so many options for eLearning, it can be tough to know where to begin. In this new workshop, Dan Freeman, Director of ALA Publishing eLearning Solutions, will help you sort through your options and strategize ways to find what works best for you. You’ll learn the benefits and limitations of different formats and how to assess the goals of your event in terms of your different options, regardless of budget or resources. Dan Freeman is the Director for ALA Publishing eLearning Solutions. In this capacity, he has run hundreds of webinars and dozens of online courses for library audiences and been involved in all facets of their production, from marketing to content and presentation and assessment. He holds an M.S. in Library and Information Science from the University of Illinois at Urbana-Champaign and has worked in several different library environments.